Every year, it seems like we do the same things around Christmas time. Like clockwork, we made the trek out to Metropolis to get Santa photos with the kiddies. However, while we were in the long lineup (even before Santa arrived for his morning shift), it quickly dawned on us that we really should be somewhere else. Why? Well, it was a glorious sunny day and the following week would not be so glorious. Hence, it would probably be the best day to do the Stanley Park Christmas train. Seeing how it was already 11:00am, we made an executive decision to ditch the Santa lineup in favour for the Christmas train lineup. So we high-ta iled it Downtown, making it to Stanley Park in 30 minutes. Viv jumped out of the car to encounter a lineup spilling out beyond the front gates. What parents do for their kids... We ended up getting the tickets for 8:30pm and considered ourselves lucky since as we left, the lineup stretched far into the parking lot. There must be a better way to do this! Now with the kiddies complaining of hunger and Viv frozen from standing in line for an hour, the only solution in my mind was Pho. Quick, hot, cheap and accessible - that was the plan. Viv queried where and I confidently stated we would drive down Kingsway and find our way. 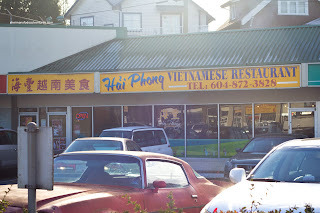 Hai Phong ended up as our eating destination partly due to Kaiser Soze (he kept raving about it all summer). 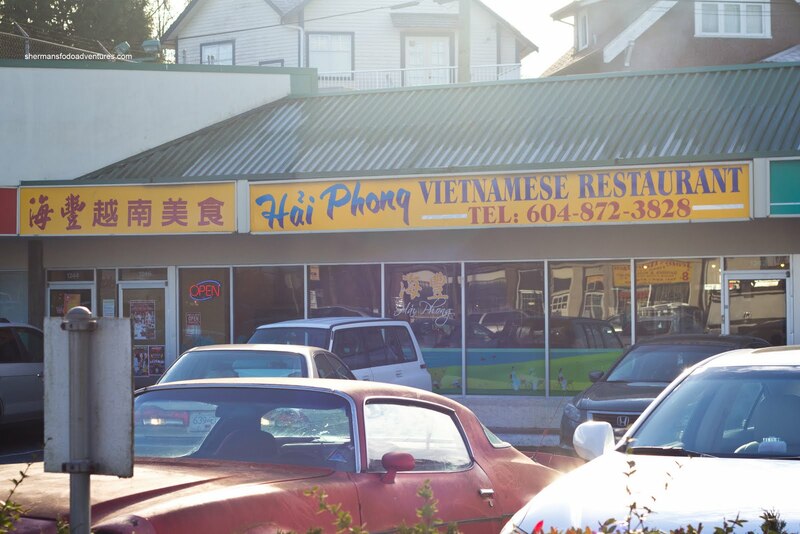 So what's so special about this place anyways, especially with all the other Vietnamese joints nearby? The thick menu consisting of items not normally found in the run-of-the-mill Pho joints was a clue. 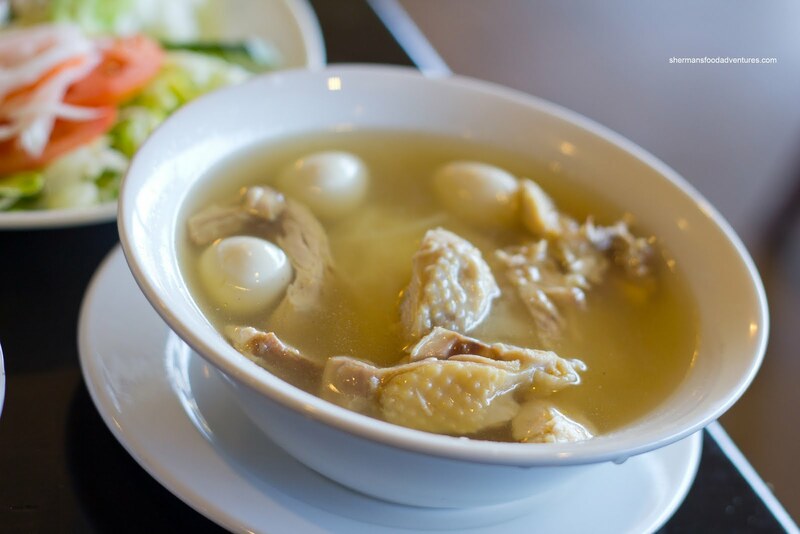 With dishes that are similar to Phnom Penh and Mui Ngo Gai, one could technically eat here for weeks on end and not have a bowl of Pho. But guess what Viv had? Yes, a bowl of Pho Dac Biet. Oh well... It was a fairly healthy portion with tender meats and a fragrant broth that had a slight spice at the end. Noodles were al dente as well. 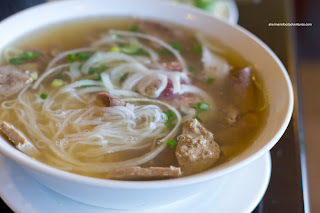 Solid bowl of Pho. 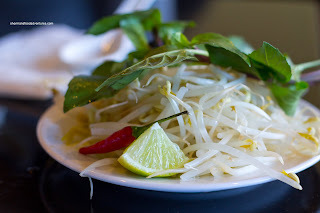 For myself, I had the Dry Noodles (which are very similar to the one you'd find at Phnom Penh). As you can see, they weren't shy about loading it up with shrimp, pork stomach, tongue, quail egg, pork and liver. There was just enough sweet soy underneath to wet the noodles while not taking away from their chewiness. Pretty good size for a small order. 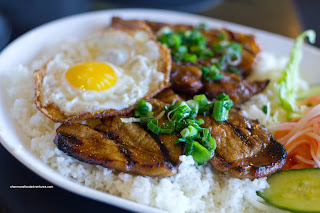 Of course a small bowl of noodles would never satisfy my appetite, so I got an order of the Lemongrass Chicken and Pork Chop on broken rice with fried egg. Sometimes, the lemongrass is an afterthought with this dish. Not here, lots of fragrance and flavour, in addition to the nice char on the meats. The deboned chicken thigh was super moist while the pork chop really needed more tenderization. The broken rice was perfect in texture, a touch dry and chewy. For the kiddies, we got them the kid's Pho Ga which came with 2 quail eggs (but Viv stuck the one from my dish into it to make it 3). The chicken was super moist while the broth was light while flavourful at the same time. The kiddies liked it and that made us happy. 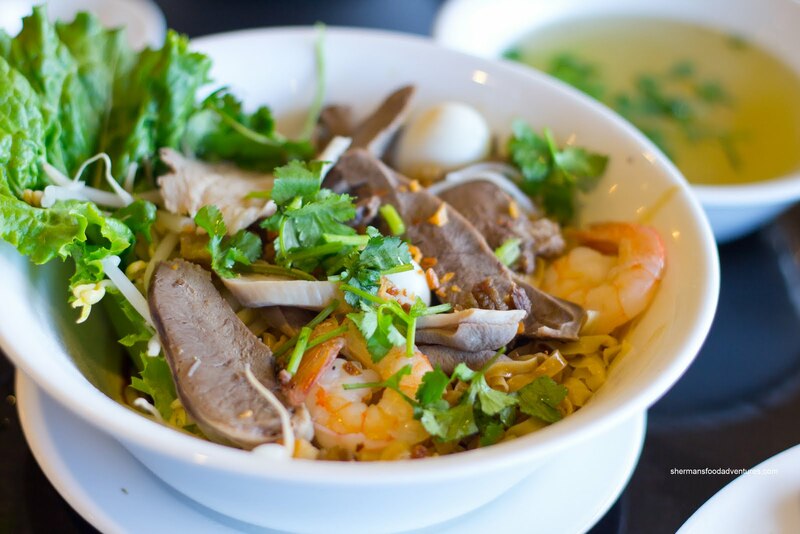 Normally, a visit to a Vietnamese restaurant does not elicit much excitement nor any huge desire to do another visit right away. However, the stuff at Hai Phong was unique and good enough for us to think about returning.